Shauna Hicks has set us all a goal of 52 weeks of Genealogical Records. The topic for Week 11 (how did that happen?!) is Newspapers. Now, like most genies I love newspapers and being a bit of an old fogey I’ve used them extensively over the years. Once upon a time it was only possible to check for news of migration, marriages, deaths, obituaries or specific events we discovered our families were involved in. That was pretty much where it ended, short of trawling through one microfilm after the other. Little did we know that the wonders of Trove were ahead of us! Trove has grown “like Topsy” and it’s astonishing the nuances it’s brought to our families’ stories. Little snippets like exhibiting a selection of colonial timbers or selling mandarins overseas would once have remained perpetually hidden from us. Shauna has already mentioned the many options there are for newspaper research so I won’t bother going into that here. 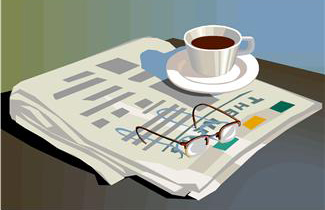 What I’d like to do is share with you some of the ways in which I use newspapers either online or, infrequently these days, offline. This method also gives you clues for births beyond those released in the BDMs. You can find the names of adult children, then backtrack through the marriages to identify what their first names are, where they lived, and when they married. If the death is beyond the dates covered by Trove, you may need to revert to the old-fashioned method of visiting the library and checking the notices in whatever was the local newspaper. You can narrow the margins of your search by using the equally wonderful Ryerson Index to pinpoint a date. Of course we love Trove to reveal those previously hidden stories I mentioned before, but do you check out the same story in different newspapers, or assume they’ll all be the same? It’s an easy trap to fall into, but they can vary in subtle but important ways, with just the addition of a tidbit of additional information. A good example is a story I wrote about Mary Ann Morton, nee Massy, on my East Clare blog last week. The same strategy applies to comparing news stories of our ancestors’ migration experiences. When looking at the long voyage of the Florentia in 1853, I compared each report on Trove and other online newspapers to see what they added or where there were inconsistencies. For example, early reports of the ship’s departure from Plymouth indicated it was going to Portland Bay, though the authorities in Moreton Bay had been advised it was intended for them. Trove has also clearly revealed just how widespread some news stories were, even in those distant pre-telegraph, pre-internet days. A story might well be reported in newspapers far away from the source of the action. For example, I first learned of a fire in Ipswich in the valuable pre-Trove days of the online Maitland Mercury. You might imagine that an event like that would be reported in the Brisbane papers, but Trove has shown us that different reporters sometimes emphasised different aspects of the story….not much different from today really. 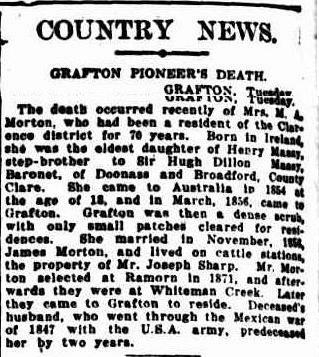 If you find an ancestor or family member has been the subject of a legal case, or sudden death, the newspapers may provide a useful filler. This is particularly the case where the official court documents may no longer exist. When reporting on court cases, journalists have to be particularly attentive to detail so you can generally get an accurate, and user-friendly, synopsis of the day’s court activity. However, where possible, you should also see if the originals exist and compare the two. Missing a relative in the death indexes? 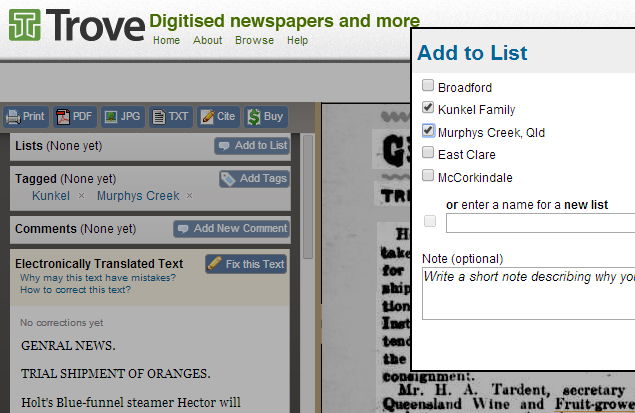 Have you checked the news stories on Trove or in the local paper offline? Sometimes this is the only place where the event is recorded, especially in the early days of in-the-bush inquests. I’ve had a few cases of this in my family history. Mind you, it hasn’t solved the mystery of when John Widdup died in or around Urana. Much as we love Trove and the other high-profile online newspapers, there are other avenues for searching. In the past I’ve used The Scotsman Digital Archive to good effect… Much depends on what you’re looking for…it’s more likely to be successful with high-profile people or general news information. Another great, but less easy to use, source is Google Newspapers. Not all newspapers are here though. Some have been consolidated into books and appear under Google Books. I suggest you try searching there for the name of your family’s place and see what newspapers come up. 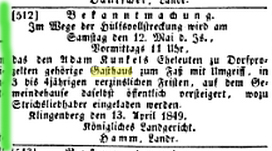 As an example I searched just now for one of the papers of my ancestor’s area in Bavaria, and this is what came up. I wrote about tracking down emigration and family stories using this source for German research here and here, so I won’t repeat myself in this post. It’s not a simple process, but can be worthwhile, though it requires good eyesight, lots of patience, persistence and lateral thinking. 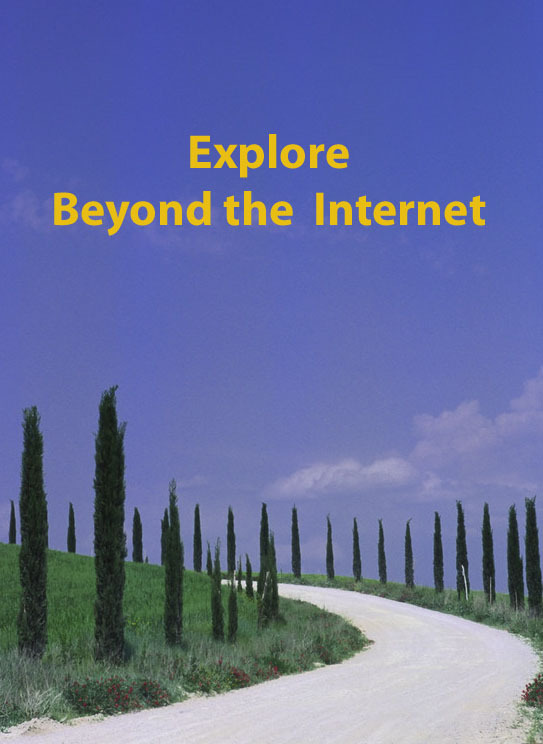 I wrote about these in my Beyond the Internet series in 2012, and you can find the post here. Sometimes you may have to go offline to find something which is referred to in another story but which doesn’t appear readily in Trove due to OCR issues. Of course what’s offline changes almost daily with digitisation programs. Tagging and listing in Trove. Many of us make corrections to the stories we visit, some do masses and I confess to being too caught up sometimes to make corrections as I go. However do you also tag the story for something or someone you’ve found in there? I’ve also recently started using the option to create lists…it’s at the top of the edit panel. This enables me to keep track of all stories relating to my one place studies in Murphys Creek, Queensland and Broadford, Co Clare or East Clare generally. And if you’re like me you’ve just launched into Trove without reading the FAQs, but I see there’s heaps of tips here, including how to search for theses (which Queenslanders can also do for local theses via the . It’s easy to take Trove for granted as it’s probably one of the Top 5 resources for Australian family historians. It is truly a world-leader and the Trove team should hold their heads high with this wonderful achievement. This entry was posted in Australian history, Dorfprozelten research and tagged German newspapers, newspapers, Trove by cassmob. Bookmark the permalink. Thanks Pauleen for a great post highlighting more great reasons to use newspapers and participating in the challenge. I have added your link to my Week 11 post. A post after my own heart and enthusiasm for what we can glean from old newspapers. I am envious, too, of your “Trove” research tool, though having now British Newspapers Online at http://www.findmypast.co.uk/search/newspapers is a great asset. . . I think the best thing about online newspapers is the chance to find those hidden treasures Susan! The great thing about Trove is that it is constantly evolving… when I first started searching there, almost immediately after it’s inception, there was little other than the main capital city newspapers… now all manner of smaller publications are available. One of my favourites to search for an insight into the Goopy family has been Queensland Punch and Figaro. Reading of their social lives, what they wore to where, whose weddings, etc. they attended, has brought to life the personalities of my husband’s grandfather and great Aunts and Uncles. I now notice certain traits that have been passed down through the family… it’s great to have someone to blame. Always good to have someone to blame Chris 😉 Like you, I’ve been using Trove since way back. The changes are dramatic and how I wish some of those stories had come to light before I wrote my Kunkel book….but writing posts helps. I haven’t found anything in either Qld Punch or Figaro but I have in the Worker….hmm that seems to say something about my ancestors…bolshie mob.